This evening dress is an haute-couture interpretation of the wrapped garments traditionally worn by West African women. The drapery and folds of the dress are mounted on a rigid boned waistband. The crisp cotton fabric, printed in Manchester, was intended for export to Africa. The fabric design imitates Indonesian batik, and the borders feature the letter 'V' and '...-', its morse code signal. V-for-Victory was a popular subject for export cotton prints after the end of the Second World War. 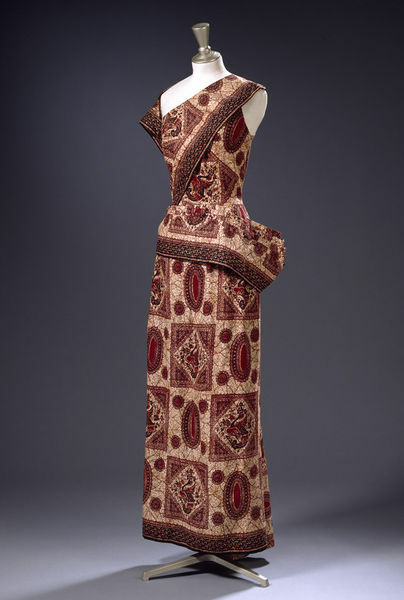 By using this fabric for a fashionable Western evening dress, the designer has created a sophisticated garment incorporating several cultures and traditions. Matilda Etches is now almost entirely forgotten except as a theatre, ballet and opera costume-maker. However, she was an extremely talented couturier, whose fashionable clothes were innovative and very carefully made. When she donated a selection of her work to the Museum in 1969, this dress and a 'Butterfly' cape (see T.185-1969) were shown to senior Museum officials as key acquisitions. They were the first modern fashion items to be accorded this honour. 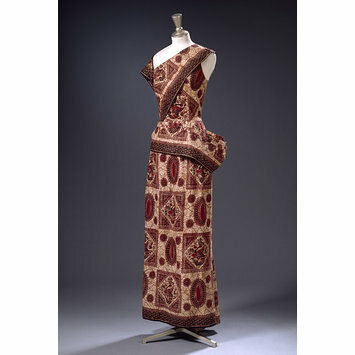 Full length evening dress made of claret and brown batik-printed cotton. With wrap-like details. Held together by a waist stay, and bodice unlined with a diagonal seam across the front. Elaborate and complex construction. Fastens up the back and down the bodice side up to armhole with hooks and eyes. the bodice has two armholes, and would be boat-necked but for the cutaway asymmetrical yoke in the front. Sheath skirt with stiffened drape at the side, designed to be hooked across the front hip and then train down the side of the skirt. The makers name tape is stitched inside the skirt. This dress is featured in Vogue, April 1948, on page 71 in a photograph by John Deakin. "I left the West African Dress on the Charles James Dress stand. It looked so well - I just wrapped it up in muslin." Historical significance: This was the first 20th century V&A fashion donation to be shown to the advisory committee, along with the red/maroon Butterfly cape.